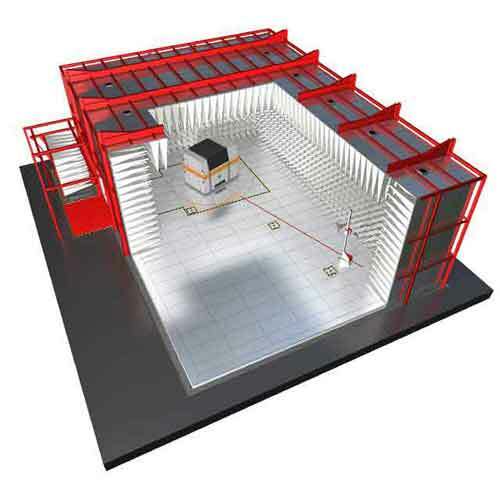 Frankonia’s full compliant and state-of-the-art, carbon free absorbers, EMC testing solution at 10m, 5m & 3m measuring distances with a Quiet Zone (QZ) of ø3,0m. With 30 years of in customized EMC chambers solutions, combined with our unique Frankosorb® absorber technology, we definitely provide a perfect combination of technology and quality to meet our customers’ needs for a future-proof partnership. The SAC-10 Plus Triton is Frankonia’s full compliant and state-of-the-art EMC testing solution with multiple test axes at 10m, 5m & 3m measuring distances with a Quiet Zone (QZ) of ø3,0m. The innovative polygonal shape along with its optimized absorber layout allows for a usage of multiple axes having a ready test setup for emission and immunity tests. The benefits of its multiple test axes allow our customers to measure all required EMI/EMS procedures without the need to modify the test environment or the test setup. The test equipment and instruments can remain connected in the chamber. The absorber areas necessary for each test can be provided with guided movement. Due to the reproducible test setup, the SAC-10 Plus offers outstanding performance for NSA, SVSWR and FU and real time savings. The SAC-10 Plus is Frankonia’s full compliant and state-of-the-art EMC testing solution at 10m, 5m & 3m measuring distances with a Quiet Zone (QZ) of ø3,0m. The innovative polygonal shape along with its optimized absorber layout is a space-saving, cost-saving and efficient solution with a single test axis. The SAC-10 Plus is fully compliant for emission tests validated according to CISPR 16-1-4, as well as full compliant for immunity tests according to IEC/EN 61000-4-3. In addition, the SAC-10 Plus is Frankonia’s most compact 10m chamber available to meet CISPR 16-1-4 and ANSI C63.4 test site requirements. 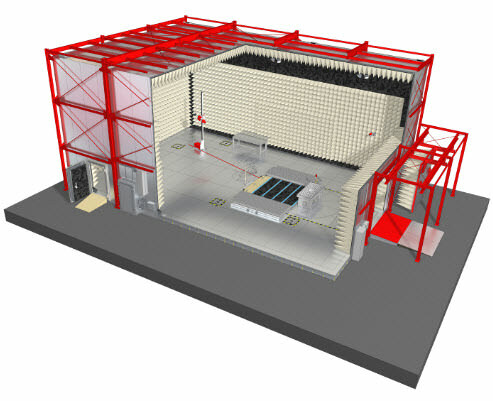 The SAC-10/H are Frankonia’s full compliant and customizable EMC testing solutions at 10,0m measuring distance with a Quiet Zone (QZ) of ø3,0m up to ø6,0m with hybrid absorber layout. 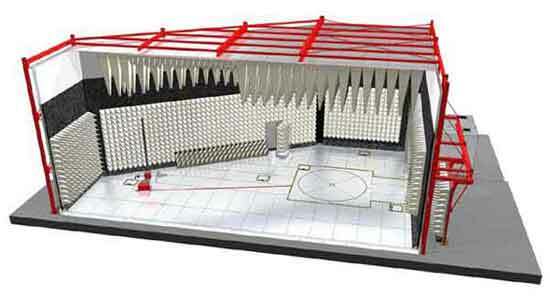 Due to the high grade of customization reflecting the demands of our customers, this semi-anechoic chamber is adaptable in size and offers several configuration possibilities. The innovative concept with its impressionable absorber layout achieves exceptional performance for emissions and immunity testing. The SAC-10/P are Frankonia’s full compliant and customizable EMC testing solutions at 10,0m measuring distance with a Quiet Zone (QZ) of ø3,0m up to ø6,0m and Frankonia’s unique long-pyramid absorber layout.